A manifesting box, or prayer box, can help us to develop the practice of turning things over to the Universe, for help, direction and resolution. Often times we come to a place where we simply have no control or responsibility for an outcome, and must rely on Spirit to move things forward. Practicing the art of letting go is much easier when you have a ritual like this one to perform, as it shows your intent, willingness and trust in letting the Universe take charge and handle things. In this way, we are assured the ideal outcome for each and every situation. A small box with a lid or other suitable container. Jewelry boxes, teapots with lids, cloth bags, or purses with closures are good options. Select a container to use as your manifestation box. You can also create or decorate one especially for this purpose. Schedule the appropriate date and time on your calendar. The ritual to initiate the box is best performed on a Sunday, or during the New Moon or Full Moon. Once established, you can use this box whenever you feel the need, as often as you like. Select clothing and music to strengthen your intention. I like to wear aqua or purple clothing, and play instrumental jazz or soul music in the background. Begin by lighting the incense, then use the incense wand to light the white candle. 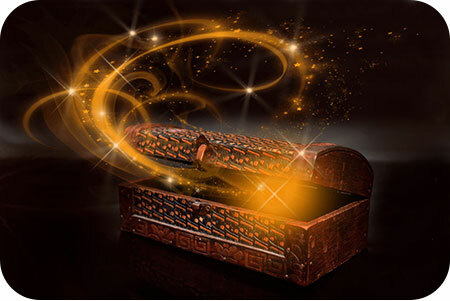 Next, take the incense wand and pass it around and inside your manifestation box, blowing gently to direct the smoke around the entirety of the box, in order to bless and charge it with spiritual power before use. Then place the charging aquamarine or amethyst stone inside the box or bag and close it. On the small pieces of paper, write your requests, prayers, concerns or questions to the Universe. At the end of each request, write these words: And I will do my part (usually our part is staying out of the way). Sign and date it, fold in half and half again, and drop it into the box. Repeat this process until all your current concerns are addressed. When you are done, blow out the candle. Place the box, or bag, in a special place where it will be undisturbed, until the next time you have a request to add to it. Once a week, light the white candle and incense again. Go through the contents of the box, reviewing each request. Remove the prayers that have been answered, and return the pending requests back into the box. Burn the answered prayers with the white candle, and give thanks to the Universe for addressing them. Practice safety when burning your answered requests, making sure to have a can, bowl or sink handy to burn them in. At this time you can add new or revised requests, creating a continuous ritual of letting the Universe guide, protect and manifest miracles in your life. Susyn lives in New Mexico, and offers Psychic Guidance, Astrological Insights and Channeled Messages that will change your life! Her credentials are top-notch and include a doctorate in metaphysical studies and certifications from The American Association of Professional Psychics and The American Tarot Guild. She's also a published author, with two metaphysical books under her belt, and has authored numerous articles and horoscope columns. In addition to her readings, Susyn is also a mentoring practitioner who teaches others how to master their own gifts, raise their vibrations, and empower themselves. A sought after guest on numerous radio programs, she has also hosted her own radio show. If you're looking for one of the truly bright shining stars who can also read them with an accuracy that will astound, look no further. You can find Susyn at PsychicAccess.com.